Polish Mazurka is a wonderful tradition in Poland. 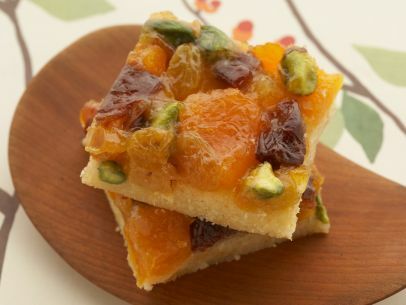 It is a delicious fruit cookie that can be enjoyed around Christmas or any time of year. Preheat oven to 375 degrees F. Coat a 9 by 13-inch baking pan with butter or nonstick spray. Line the bottom of the pan with parchment paper. For the cookie: Whisk the flour, baking powder and salt in a bowl. Beat the butter and sugar in a large bowl, with an electric mixer, at medium-high speed until creamy, about 2 minutes. Scrape down the sides and add the egg and vanilla extract. Beat well, and then scrape down the sides. While mixing on low speed, add the dry ingredients in 3 batches. Scrape down the bowl between each addition, and mix until just blended. Transfer the dough to the prepared pan and spread evenly with a spatula. Bake until light golden brown with spots of darker golden brown and darker edges, about 30 minutes. Cool completely, about 45 minutes. Meanwhile, prepare the fruit: Whisk the cornstarch and sugar together in a small saucepan. Whisk in orange juice until mixture dissolves. Stir in the fruits and candied orange peel. Bring to a simmer over medium, stirring often; continue to cook, stirring until thickened into a compote, about 3 minutes more. You should be able to draw the spoon along the bottom of the pan and see the pan with no liquid seeping back. Remove from heat and transfer to a bowl. Stir in the nuts and lemon zest. Spread fruit evenly over the top of the cooled crust. Heat oven to 350 degrees F. Bake mazurkas until golden brown around edges and fruit sets but is still slightly glossy and jewel-like, about 10 minutes. Cool in pan on rack. Cut, using an oiled knife, into 24 bars. Serve. Busy baker’s tips: When double-wrapped, the cookie base keeps at room temperature for 3 days or frozen for 1 month. The fruit compote can be made up to 1 week ahead and refrigerated. Store completed cookies in an airtight container, layers separated with parchment paper, for up to 5 days. This entry was posted in Cooking with your Polish Pottery on July 6, 2015 by Sara.